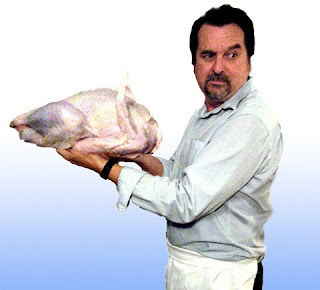 The 99 Cent Chef is celebrating his 2nd year of food blogging today. It's all good fun -- wielding a whisk in one hand and a camera in the other. Food is one way I explore this great metropolis, Los Angeles. 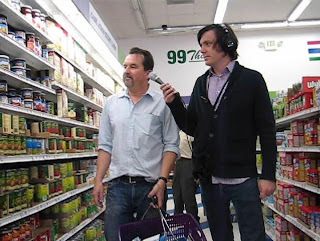 I have the best of both worlds: brainstorming in the kitchen, coming up with (hopefully) tasty, budget cuisine -- then bolting out of the condo and hitting the streets to track thrifty dining trends. Video highlights from this vlogging year - one year reduced to 6 1/2 minutes. Number one, I would like to give a hearty thanks to my discerning readers for all the generous comments! You are the only way I know if a recipe really works. More thanks to all my fellow bloggers and journalists for getting the word out, including: Brad Tuttle at Time.com, Kevin Roderick at LA Observed, Pat at Eating L.A., Frazgo at Metroblogs, Elina Shatkin of the L.A. Times' Daily Dish, Julia the Bargain Babe, Alexza at NBC Nightly News, Karen Datko and Donna Freedman at MSN Money, Nicolas Bérubé at LePresse, Jenny Cunningham at Sunset Magazine, Brendan Newnam at NPR Radio, and "Anne & Burl Live" of BlogTalkRadio. 99 thanks to all of the 99 Cent Players, in front of and behind the video camera. These include: neighbor Pete, Bob McGinness, Nuno Pinheira, Dan & Diana Kohne, Jay Cotton, Bob "the ump", Drew Redford, my sisters Brenda and Denise, and her husband Dale, my Mom, and especially, the number one taste-tester, my wife Amy. This food blog would be undercooked without their creative contributions. I've picked up the pace in my reviews of budget eateries and tips on how to dine on a dime in L.A. 99 thanks to Soe at Jasmine Market & Deli for allowing me to video behind the counter in his tandoori oven kitchen; Mary Sue Milliken, Dino, Vanessa and Anthony of the Border Grill Truck for letting me climb aboard; Chef Roy Choi of Kogi Korean BBQ Truck; the cooks of Nom Nom Truck, including owners Misa Chien and David Stankunas, for showing me the inside of a Vietnamese Banh Mi sandwich; and finally to Chef Marilyn of Soul Food Express for a fun interview, and all her kind customers who chatted with me. This year alone I've come up with 23 videos often marinated in comedy: for example, I donned a wig and pearls to play Julian Child, nephew of Julia Child, while I whipped up buttery Crepes Suzettes; and created an out-there video series on "moveable feasting" in some of the tastiest food trucks on the L.A. scene - videoing day and night along back streets from Manhattan Beach to Koreatown, and Venice Beach to East L.A. This Chef does not live by recipes alone; some of my videos are just an excuse to play with food -- ever tried to dribble an onion or slam dunk a banana on the basketball court? 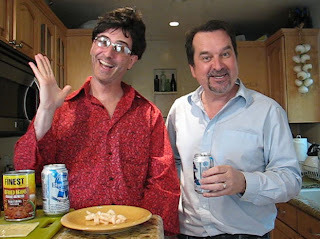 I cried real tears in my video "Shooting Produce" - a collaboration with funnyman and neighbor Pete. Eating and driving? Don't! Just watch my Public Service Announcement cautionary tale. And watch the Chef chew the scenery, in green spandex, as "The Wrestler," (children, please cover your eyes) in his annual Oscar Special Video. 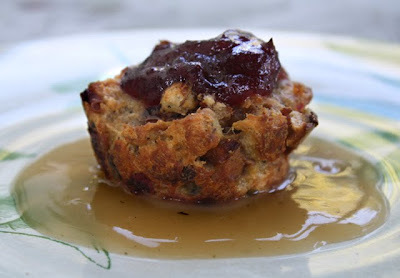 Since last November 30th, I've written about 50 budget recipes. Who would think my Krispy Kreme Doughnuts Recipe would be pushing 20,000 viewer hits on YouTube! Living in L.A., I'm exposed to a mixed stew of international neighborhoods, all of which inspire my recipes: eatables like Vietnamese Banh Mi Sandwiches, French Onion Soup, Indian Almost Tandoori Chicken, and south-of-the-border Pollo en Mente (mint chicken). Keep checking back, this chintzy chef has a lot more cheap recipes, restaurant reviews, yummy photos, and out-there videos in store for you. 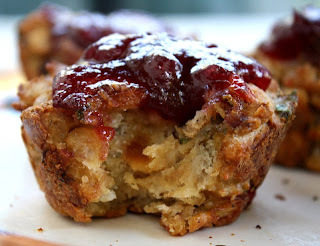 And now it's time to recharge the camera batteries and clean up the kitchen for another blogging year! Click here to view or embed 2nd. Anniversary Video on youtube. Bright orange and tasty to boot, the 99 Cent Chef's Yam Fries are a nice change of pace from typical spud fried fare. You can add a cookie sheet full on the oven bottom rack as the Thanksgiving turkey if finishing up. It's a nice change of pace from a casserole of mushy marshmallow-topped baked sweet potatoes. 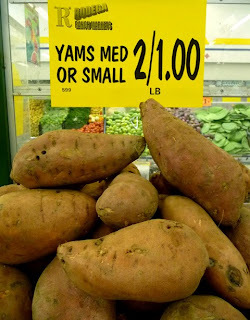 Yams are often on sale at most markets, and especially ethnic ones like my local Latin market -- anywhere from 4 to 2 lbs. per dollar. I've fried them in oil like regular russet potatoes, but they usually come out somewhat soggy and limp. A surfire method that is lighter is to simply slice, season, sprinkle with olive oil and bake on a cookie sheet. Yams have a lower sugar content than Sweet Potatoes so they are less likey to burn. 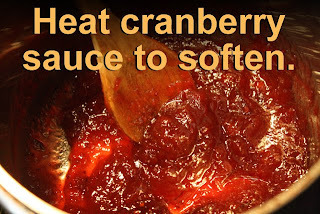 Of course you can use sweet potatoes, but watch carefully, and you may need to reduce cooking time by a few minutes. Preheat oven to 375 degrees. Peel yam and slice into 1/2 inch wide and an 2 inch long spears. 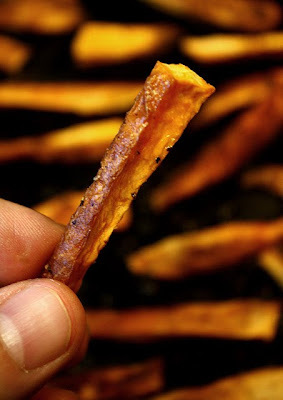 Yam are sometimes difficult to slice, so don't worry if "fries" are uneven and broken. Spread out yam fries on a metal cookie sheet, ok if they touch, the heat will shrink them. Sprinkle with cumin, salt and pepper. Lastly drizzle with oil and cook for about 45 minutes. Turn once about half way through to brown fries on both sides. 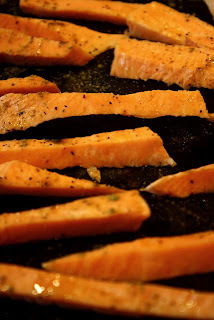 Sweet potatoes have more sugar so cooking time may be shorter; watch them carefully to prevent from burning black. Ride the Squash Blossom Quesadilla Special from Little Tokyo to Mariachi Plaza with The 99 Cent Chef as your culinary guide. Play it here. The video runs 6 minutes. 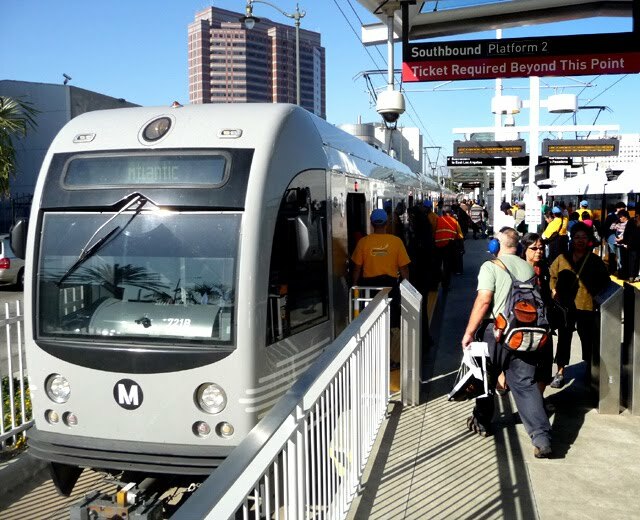 The Chef and his wife rode the rails on opening day, Sunday, for the Gold Line subway extension into East L.A. We got to the train yard on 1st and Alvarado by 10am and easily boarded the gleaming train cars for a ride to the end of the line. 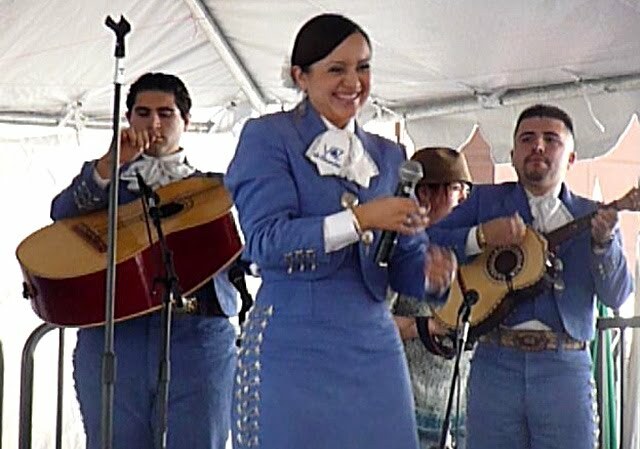 L.A. County Supervisor Gloria Molina was at the East L.A. Civic Center for a ribbon cutting, and right up the hill in the same park was the East L.A. Farmers Market in full swing, alongside a row of white tented food stalls with maddening aromas, and tempting free samples including: fresh roasted peanuts and skewers of Korean BBQ chicken and beef. After a few samples, the Chef and his wife were ready for a real meal, and we headed to Mariachi Plaza Station on East 1st Street -- it's a Latin restaurant row. 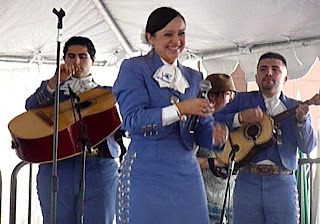 We passed bandstands teeming with horn, violin and guitar players belting out passionate Mexican ballads, stalls ladling sweet cups of horchata, and local artisans selling Mexican skull and beer cap boxes along with life-sized skeletons. Quite an eye and earful. The L.A. Times published a great subway stop restaurant listing in its Wednesday Food Section, so we had a lot to choose from. You can see the listing online here. Goat stew at Birriera Jalisco? No way the Chef's wife would go for that; that's a future solo trip. 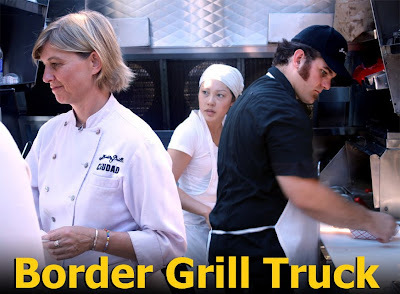 Upscale classic Mexican cuisine at La Serenata de Garibaldi? Too expensive for this chintzy chef. 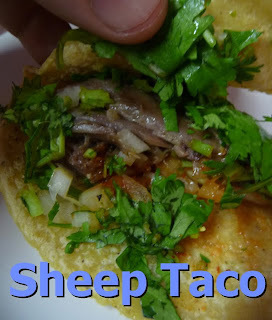 Squash blossom quesadillas and sheep tacos at hole-in-the-wall Taqueria Las Cabanas? Bingo! 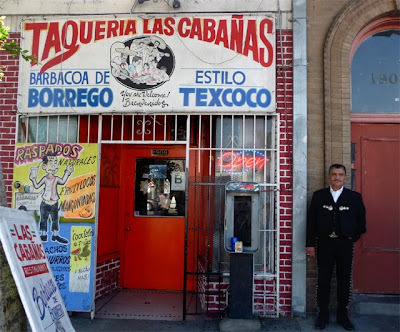 Located two blocks away from Mariachi Plaza at 1908 3/4 E. 1st Street, Taqueria Las Cabanas Restaurant is a small red room with about 10 tables, and no menu was offered. On the wall are food entree pictures and a list of their specialties, including quesadillas served in handmade fresh pressed corn tortillas. These tender yellow-hued corn discs are thicker and larger than store bought, but somehow taste lighter. The fresh grilled flavor is subtle, like tamale masa. The Times article recommended squash blossom quesadillas and we bit. Boy, were they fantastic, and well worth $3 apiece. 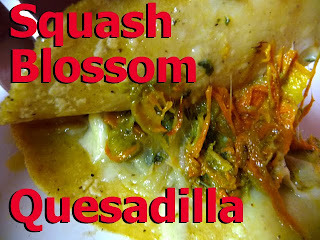 The delicate squash blossoms paired perfectly with melty cheese and soft fresh corn tortillas. Squash is not subtle -- the blossoms are. Our waitress, Maria, says her family has a garden and picks them fresh. Along with the quesadillas, we ordered Sheep Tacos for $1.75. The rich, earthy meat is shredded but still chunky, slow-cooked tender, and almost sweet -- simply delicious to this mutton-loving Chef. The taco is topped with chopped onion and cilantro; spicy red and green chile sauce is set out on the tables. 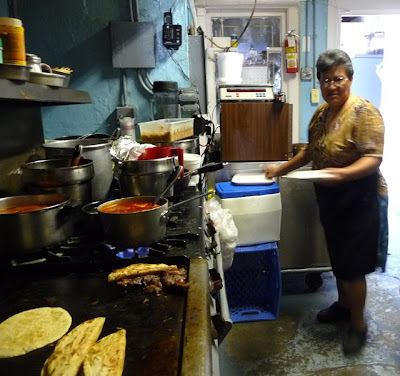 Maria and her mother, Juana, were kind enough to allow the Chef into their kitchen to see the tortillas rolled, pressed and grilled -- Juana makes quick work of it -- and the kitchen is filled with intoxicating smells of grilling meat and simmering soups. This Chef will soon return for more. Was it too expensive to build, yes; is it clean, quick and comfortable, yes -- does it disrupt neighborhoods and fall short, yes; does it allow for convenient connectivity to disparate communities, yes -- and finally, to this citywide-neighborhood-exploring Chef, is it the right thing to do? It is. I can't wait until the Downtown to Culver City Metro Line, with a stop just 5 city blocks from my front step, is completed; you can be sure we will be riding it on opening day, and that I'll be prepping a personal 99 Cent Chef Neighborhood Dining Guide for the occasion! 1908 3/4 E. 1st St. It's semi-truth in advertising. They got the pasta right, and the meatballs with cream gravy, too. But where's that 'Swedish' flavoring? This dish must have been kitchen committee- tested to death, because there are no discernible seasonings except salt. I think I tasted a smidgen of Worcestershire sauce and some onion powder, but that is about it. 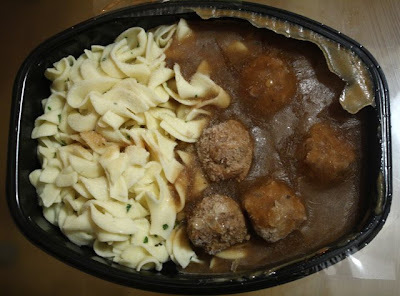 Normally, you get minced onion and nutmeg-permeated meatballs -- I know this because I made "Ingmar Bergman Swedish Meatballs" last April and have eaten enough times in Ikea's cafeteria to be familiar with them. This Lean Cuisine entree is still a good Deal of the Day: the serving is substantial, compared to the usual minuscule portions, and I like the substitution of pasta for typical boiled red potatoes. 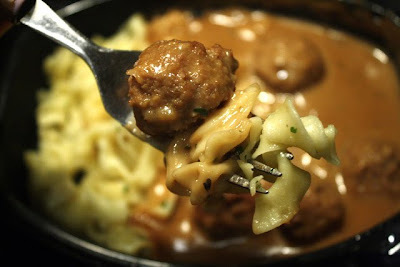 You do get five filling small meatballs, the pasta is tender, and the cream gravy is rich tasting. 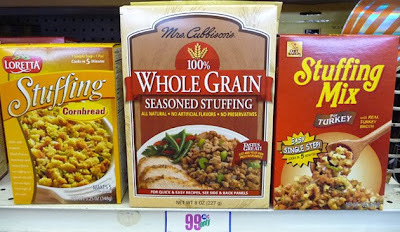 It's just a little bland for 'Swedish' meatballs -- if you are going to call it that, then try to get the flavor right. I am a fan of Lean Cuisine because this Chef has to watch his figure, when he makes his appearances on the small computer screen. This frozen entree microwaves more evenly than normal, and there is enough gravy to coat all of the pasta. Plus, this dish is bland enough to appeal to the pickiest meatball-loving kid. 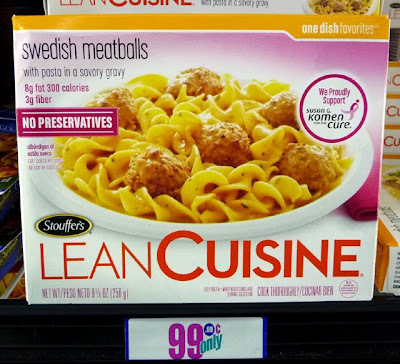 On The 99 Cent Chef's scale of 0 to 9, 9 being best, I give Lean Cuisine's Swedish Meatballs With Pasta a 5 ! I picked some up at this 99c only Store and tweeted about it Monday. I have the feeling they may linger in the frozen deli case until their expiration date. OK, it's just canned, drained and chopped black olives with oil on toast. 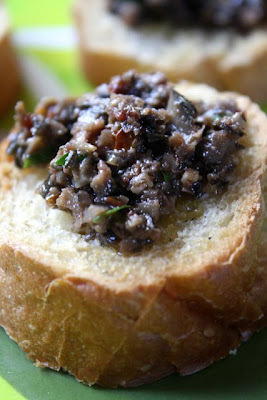 A French appetizer, tapenade is typically made with capers, black olives, anchovies and olive oil. Just put it all in a food processor until it's the consistency of hot dog pickle relish. 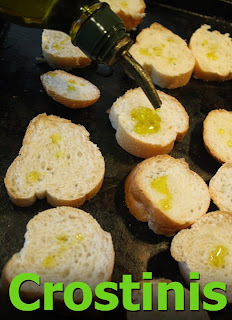 Crostini is Italian for "little toast" made with olive oil, salt and pepper. The Chef's latest recipe is sophisticated and simple, like a black evening dress -- a perfect party starter. 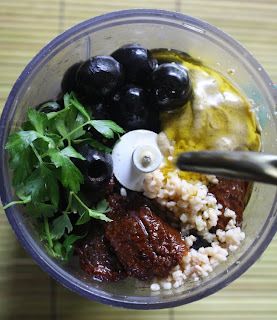 Black Olive Tapenade is a quick budget appetizer that you can make your own. There are many variations that the Mediterranean region has adapted -- so feel free to do the same. If you have sun-dried tomatoes in oil, add it; don't like anchovies, leave them out; capers too expensive, add a little chopped garlic instead; got some window-box herbs, add a few sprigs. This versatile appetizer can be served on your favorite cracker or cut pita triangle as a canape. It even goes well as an extra topping on The 99 Cent Chef's Pita Pizzas. Black olives are a favorite budget item this black-tie-avoiding Chef never tires of. All the following ingredients are optional -- use any or all. 2 French rolls - 6 inch size or just 1/2 loaf - sliced. Drizzle bread slices with olive oil and salt and pepper. Toast in oven or toaster oven for about 7 minutes at 350 degrees until lightly browned. 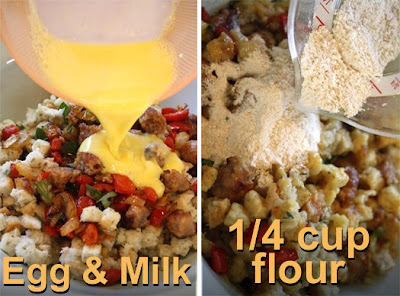 Simple, just combine all the ingredients you have on hand and blender, or food process, until finely chopped. 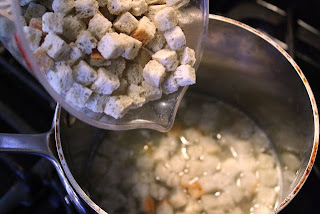 Ready to serve on Crostini toast, crackers or pita triangles. 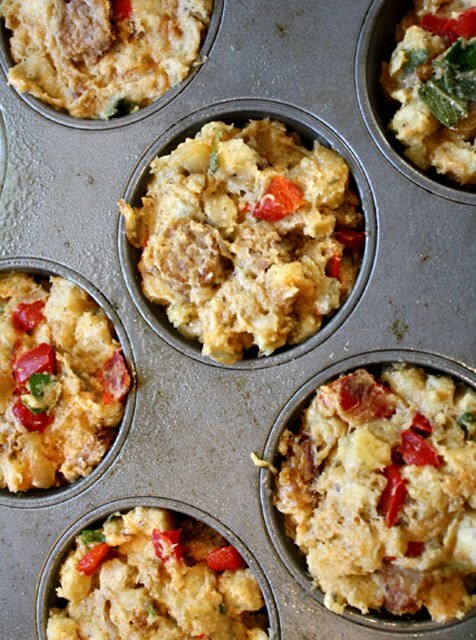 You can prepare way ahead and store in the refrigerator. Allow to come to room temperature before serving. *Ok to use less olive oil, too. Stop! 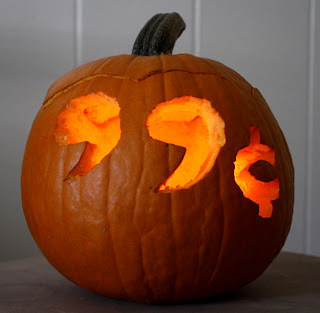 Don't throw that pumpkin away yet! 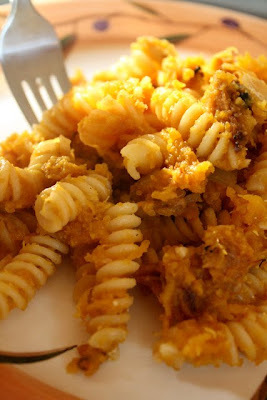 The 99 Cent Chef has a delicious way to use the parts without melted candle wax -- a vegetarian delight of roasted pumpkin with fusilli (pasta). Roasted and scraped from the skin, the pumpkin's soft flesh is sweeter baked than boiled, and the color is a richer orange, too. Baked pumpkin is drier, so the pasta sauce will be chunkier, like mashed potatoes, and wedge itself in the coils of fusilli. This is a tasty and intense pasta sauce needing only a few more ingredients. 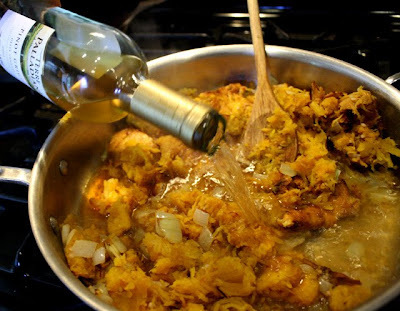 Stir roasted pumpkin into sauteed onion and garlic, then make it all sweeter with 99 cent white wine. 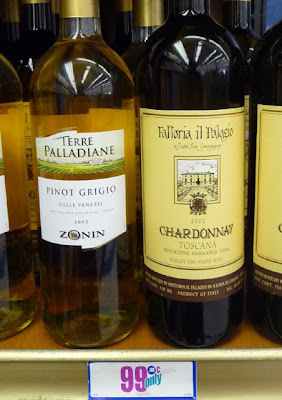 Yes, white wine is back at 99c only Stores, and of the Italian variety! I tweeted about it two days ago. The drought is over! White wine is generally too sweet for this chef's palate, but the Fattoria il Palagio chardonnay is dry, just the way I like it - I bought a case and a half. The other Italian wine is Terre Palladiane, a pinot grigio, and it's sweeter, so I added a cup of it to the pumpkin sauce. Call your local 99c only Store first to see if there's any left; these Italian wines are worth every penny and I'm sure it will fly off the shelf. The 99 Cent Chef would like to thank Mario Batali for the basic recipe concept; however, I think I improved it considerably with roasting and the addition of white wine. I also left out hot red chile flakes. Of course, you can use acorn or butternut squash -- hey, try any type unique to your area, and tell the Chef how it works out. My recipe below serves four; if you used canned squash for a smaller serving, just cut other ingredients in half. 4 cups of roasted pumpkin (butternut or acorn squash, or from the can). 1 package of fusilla pasta - you can use any type of pasta you have, even speghetti. 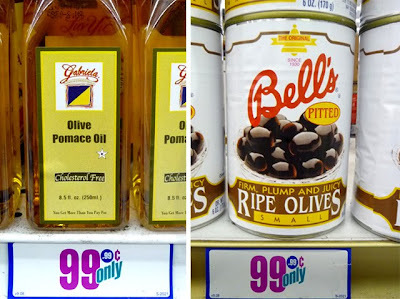 1/4 cup of 99 cent dried cheese blend or any parmesan you have on hand, to finish dish. Break apart pumpkin, remove seeds and stringy membrane. Lay out cleaned pieces on a couple of flat cookie-type pans. Drizzle olive over both sides of pumpkin, salt and pepper, and turn all pieces flesh-side down with outer skin showing. This will keep the flesh from totally drying out. 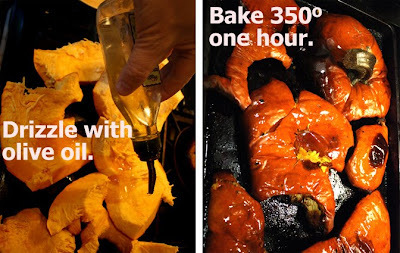 Bake at 350 degrees for one hour -- for thin skinned squash check after 45 minutes, it may be cooked enough. Remove from oven and allow to cool down. In a large bowl, spoon out the roasted flesh from the skin. 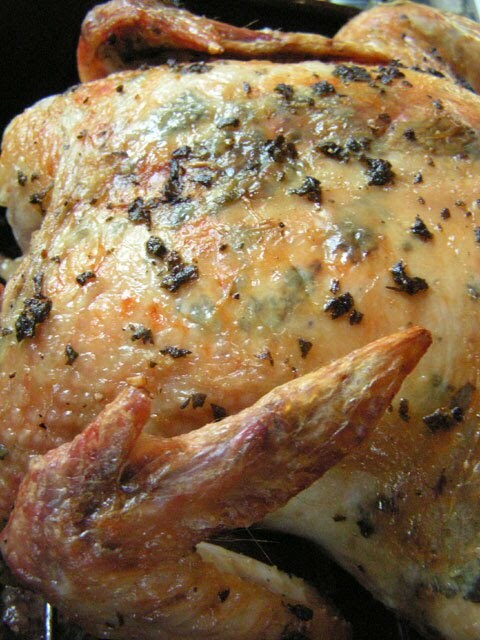 Due to roasting, the flesh will brown and even blacken. 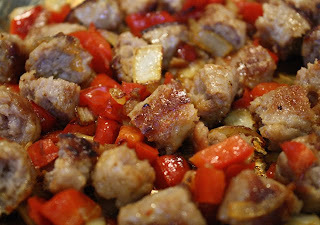 Remove the most blackened bits but keep the rest; it adds color and contrast to pasta sauce. Go ahead and taste how sweet the pumpkin is. You can serve it just like this, with a little butter of course, or puree with stock and cream for a soup. OK to freeze any you do not use. Boil water for pasta and follow cooking directions. I reduce time for al dente pasta. In a large pan, saute chopped onion and garlic in 1 tbsp. of oil for 5 minutes until soft. Add 4 cups of roasted pumpkin (or canned) and pour in 1 cup of white wine, broth or pasta water. Mix well, but leave pumpkin chunky. Heat through for about 5 minutes more until hot. Mix in cooked pasta and dried cheese blend or parmesan.